Italy's Luca Di Silverio and Claudio Fuiano deserve utmost praise for their volumes of discs devoted to composer Roberto Nicolosi's scores for historicals, horror, and peplum. Volume 1 of Mario Bava soundtracks cleverly pairs two of Bava's early 1960s movies by reason of female eyeballs! BLACK SUNDAY is likely the most iconic Bava opus. Some of the instrumental timbres employed by Nicolosi (and by his orchestrator Pierluigi Urbini) are reminiscent (to me, anyway) of Gerald Fried's late-1950s genre scores (especially the brass, with great parts for Tuba) and, as well, some of Dominic Frontiere's music for THE OUTER LIMITS. With his EVIL EYE (aka THE GIRL WHO KNEW TOO MUCH), Nicolosi continues in a similar vein (he he he) as with BLACK SUNDAY's instrumental palette, despite this EVIL EYE being a serio-comic thriller. Nicolosi adds jazzier elements into the mix, sounding not unlike Johnny Mandel. Here's volume 4 of Digitmovies' Mario Bava line of soundtracks. It's a 2-CD set, but it's not an all-Nicolosi program (disc 1 is I VAMPIRI by Roman Vlad). Disc #2 - CALTIKI - is my overall favorite film score by Roberto Nicolosi. The CALTIKI soundtrack is full-bore monster music, which rolls ahead of both THE BLOB and X-THE UNKNOWN. CALTIKI's in-your-face score should also be in-your-ears as a great companion piece to FSM's 2-disc set of Gerald Fried's vampire music! Volume 3 of Italian Peplum is also the first CD to have an unpaired stand-alone film score by Roberto Nicolosi. This Peplum entry is not typical because this WAR OF THE ZOMBIES combines netherworld atmospherics with the genre's standard-issue grandiose heroics. These disparate ingredients concoct a brew that is not always easy going down. The thin-sounding brassy fanfares are not unlike Dusan Radic's contemporaneous soundtracks for THE LONG SHIPS and GENGHIS KHAN. 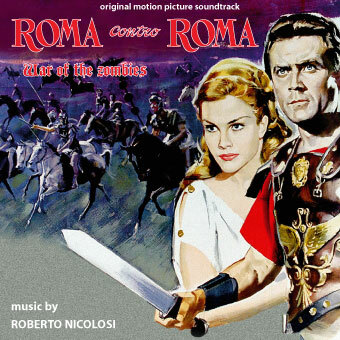 During this ROME AGAINST ROME album, the listener next encounters (sequentially) Nicolosi recycling a musical motif from BLACK SABBATH with subdued Johnny Mandel-type aloofness before moving onwards into proto-Ennio Morricone acid-rock psychedelia and further onwards to Tristram Cary-style mechanically filtered tapes of choral intonations whose pitches are modulated. It would be interesting to speculate how much further Nicolosi would have gone if he continued to score films over the next 25 years (Nicolosi died in 1989). This was not to be, however: Nicolosi's contract with Galatea was finished by 1965. This soundtrack is likely to remain the most recent score by Nicolosi on CD. Volume 6 of Mario Bava contains 3 scores in a 2-disc set. These are Bava-related historicals, though - not horror. And not all of them are solely by Nicolosi. Disc 1 is mono; Disc 2 is stereo. The most impressive of these is actually Angelo Francesco Lavagnino's ESTHER AND THE KING, whose score underwent modification by subsequent re-shoots and additional music by Nicolosi. As for the other 2 scores by Nicolosi on this volume, ERIK THE CONQUEROR is the finer work. ERIK THE CONQUEROR possesses a similar soundscape to BLACK SUNDAY and THE EVIL EYE: a unique mixture of one-third Fried and one-third Frontiere, yet the whole is 100% Nicolosi. It is to Nicolosi's credit that he bridged the Italian "Silver Age" with its "Golden Age" with his music while being older than his Silver Age contemporaries (Nicolosi was born in 1914). THE WHITE WARRIOR, unfortunately, surfaces as the most old-fashioned out of all of Digitmovies' albums on Nicolosi. Swashbuckling flourishes and courtly fanfares alternate with archaic gentility and naiveté. The most complimentary comparison I can lend to this WHITE WARRIOR is that one may like this if one likes Clifton Parker's DAMN THE DEFIANT! 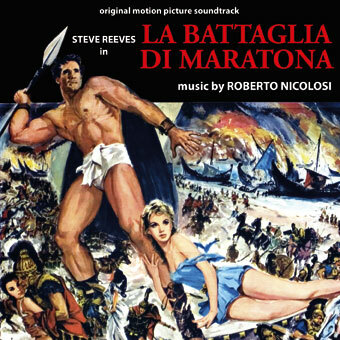 Miklos Rozsa fans may be interested to learn that this volume 7 of Italian Peplum offers a Rozsa-sounding score for this GIANT OF MARATHON. Nicolosi sounds the least like himself with this effort, which contains ethnic dances and overall exoticism in a typical Rozsa fashion (with fugue-like passages, too)! segment 1 - IL TELEFONO: cool metropolitan jazz a la Johnny Mandel, merged with some atonal pyramid stings. Sounds like a good companion to Leonard Rosenman's CHAPMAN REPORT, and looks forward a bit towards Mandel's POINT BLANK. segment 2 - I WURDALAK: the picture's main theme is given a somber fox-hunt gallop plus many variations thereafter. Lyrical pathos alternates with unexpected asymmetrical musical stings and some funereal organ chords. This, to me, is a more developed musical treatment of Nicolosi's prior BLACK SUNDAY raw material. 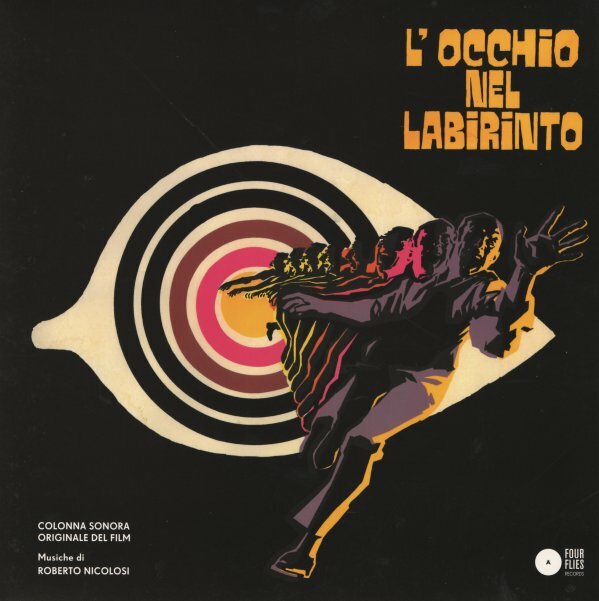 segment 3 - LA GOCCIA D'ACQUA: my favorite of this trio takes a theme from the prior episode and wrings it through sparser chamber music orchestrations. It is the most psychedelic of the three, communicating a gnawing dread via the percussion and searing the senses with its organ chords. Listening to A DROP OF WATER, I hear an aural kinship with some passages of George Duning's music for "The Empath" episode of STAR TREK. In summary, BLACK SABBATH is a rare instance of an anthology film receiving a well-integrated musical mortar uniting separate stories with shared motifs presented in a "Theme and Variations" form. In this sense, this album is similar to Jerry Goldsmith's THE ILLUSTRATED MAN in concept, if not in musical vocabulary. Digitmovies has produced these 6 volumes over 5 years (2005 through 2009), with 2007 witnessing 2 albums of Nicolosi. However, 2010 and 2011 haven't yielded any further crop of Nicolosi music, and there doesn't seem to be any indication of Nicolosi in the pipelines for 2012. Only now I have found this thread which deserves a lot more attention than it had received in term of replies! I like the music of Roberto Nicolosi very much and have all of the Digitmovies CD's except for I Vampiri and I Tre Volti della Paura. I wholeheartedly agree with Mr. ToneRow's comments on the respective albums. The reason why I searched the forum for Nicolosi was that I saw the old Italian movie IL SICARIO (1961) in a local cinema today. While sparse, the music was highly effective and very interesting, also with some jazz influences not untypical for Nicolosi's early 1960's sound. The movie was very good as well. Perhaps we will see more Nicolosi on CD from Digitmovies or Beat soon. Glad you appreciate the music of Nicolosi, Dorian. Unreleased Nicolosi soundtracks don't seem to be on the horizon, however, if we witnessed a Gino Marinuzzi peplum last year as well as a disc of three Giovanni Fusco scores, then I suppose anything is possible! 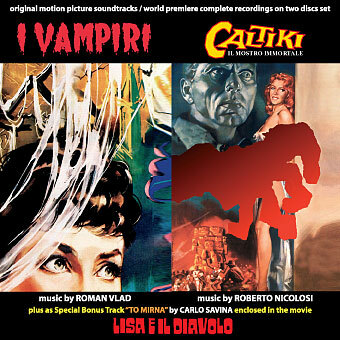 Seems, also, that Nicolosi's CALTIKI soundtrack might benefit from a re-issue since that volume of Mario Bava has been sold out a while ago and it appears that there's still a market (a niche within a niche) for a Bava title such as this one. I have been considering the three Giovanni Fusco scores on GDM, early scores from the RCA Italy I believe. I'm not sure how these compare to his Antonioni work? How many volumes were released in Digit's Bava-Series? Indeed, CALTIKI and Trovajoli's ERCOLE AL CENTRO DELLA TERRA (another Mario Bava soundtrack) are 2 Digitmovies soundtracks that I missed and that are now OOP and very difficult to locate. In case of a re-edition I would definitely buy both, but I am wondering how many more people would do so? Influenced by this thread I am currently playing ROMA CONTRO ROMA. I would be also interested in some comments regarding the Giovanni Fusco three-fer CD from GDM. I love his LA GUERRE EST FINIE (also an interesting film) as well as the Antonioni scores. They also released Gino Marinuzzi's TERRORE NELLO SPAZIO but not numbered as 'Mario Bava Anthology Series'. In my opinion, the Fusco three-fer CD is a highly interesting and very rewarding album above all for those who have already heard a few other Fusco scores and enjoy his often abstract and economic style. So the scores are certainly not for everyone, but the CD is a winner if you are open for something fresh and unusual. There is great variety here and each score is a different entity. In LA CORRUZIONE you may probably find the most overlappings with the Antonioni scores of about the same time. Harsh dissonances and long-held chords with few instuments offer a modernistic musical landscape with a lot of surprises. For me one of the highlights is the long track 16 with more than 6 minutes which gets very lyrical with woodwind soli accompanied by organ and which almost attains a spiritual quality. A really wonderful track. In between the score tracks there are some twist source music tracks similar to the ones of L'ECLISSE. VIOLENZA SEGRETA on the other hand has become famous through the Morricone-arranged song "Un idolo nero" which is sung by Gino Paoli. This theme is the basis for some mystical, magical variations for piano, orchestra and choir where you can feel the influence from Debussy and particularly his "Clair de lune" here. As he often likes to do, Fusco also puts the main emphasis on the piano. So this is a very impressonistic score. And again, in between some lounge tracks which were the only ones which could be found on the old RCA EP in 1963. The last score on the CD, I SOVVERSIVI from 1967, is again something completely different. And it is one of the most unusual scores I have ever heard. But it is very dynamic, pulsating and invigorating so that it is hard to resist its intoxicating flair. Fusco mixes a powerful march with Latin rhythms as well as male and female solo vocalise and alternates it with playful strings and then more austere, angular chamber music with a strong influence by Strawinsky. It is delicate and aggressive music at once. Certainly not for everyone, but I myself find it very refreshing and can recommend it very much. Thanks, Dorian! Since the last Vol. was released in 2009 I thought I perhaps missed something. Sorry I didn't reply sooner, but Stefan Schlegel has responded in detail. Of the 3 Fusco scores, LA CORRUZIONE is most like Fusco's music for Antonioni. other Fusco CDs, such as his peplum or his pop music material fluctuate significantly in styles. Nice thread Tone, a lot of work but most informative. Too bad Caltiki is OOP. I'd love to listen to that. Robert Nicolosi is just one of a host of under-appreciated Italian Sword & Sandal, Spaghetti Western, Exploitation, and Horror movies which are systematically being resurrected and preserved for the future by Digitmovies. To me these movie soundtracks are among the most under-rated scores of recent times. The Italian composers delivered quality scores to a wide range of B movies that are still innovative, enjoyable, and satisfying to the modern day listener. Buy them while you can, I don't think they will be easy to find in the future. Thanks for bumping up this thread, lostinspace. I don't think Roberto Nicolosi had scored any Euro-Westerns because they were being made after Nicolosi's tenure in film scoring subsided by 1964. I'd love to hear whatever Nicolosi would've written for Westerns or giallo, though. As for reissues of sold-out Digitmovies CDs there may be a little hope: Digitmovies recently packaged 3 of their OOP Cipriani albums and make them available again (Cipriani apparently has a large following in Japan). Couldn't agree more with you. While I wouldn't want to waste my time on 98% of the Italian movies made in the sixties and seventies, I'm always looking forward to new releases of their soundtracks by the excellent Italian labels working today. After more than 5 years since CDDM144 (Black Sabbath) was issued in 2009, Digitmovies will release another Nicolosi album! (Italian peplum volume 32 ). Nicolosi's Colossus And The Amazon Queen was released after his Black Sunday and just prior to Esther And The King, all during 1960. Two musclemen come up against a tribe of Amazon women. Wow! This is on my wish list regardless, but I sampled the SAE clips and the music sounds even better than I've anticipated! 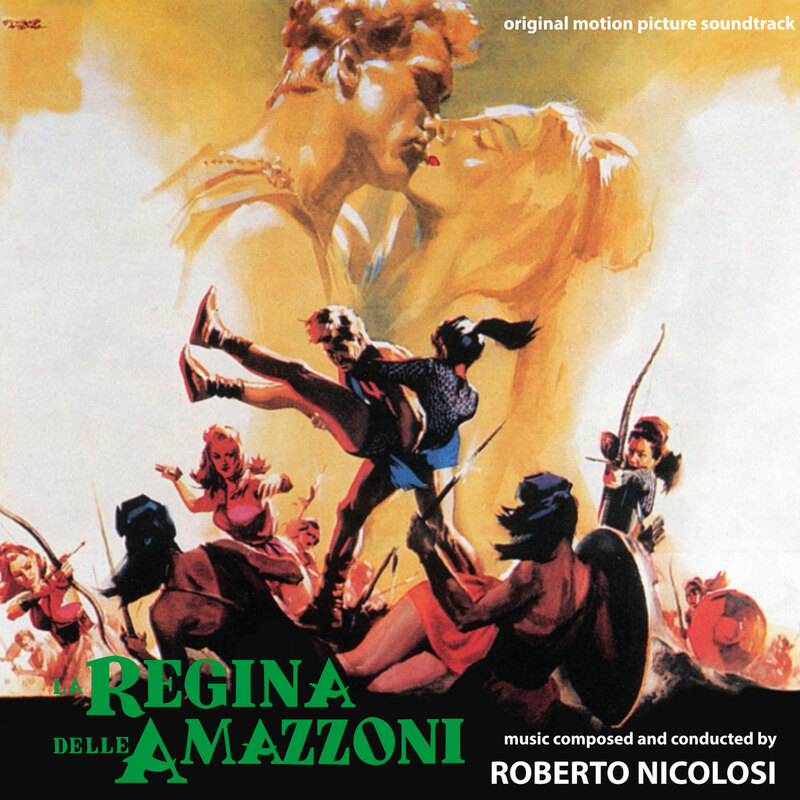 If anybody's ever wondered what an Italian peplum might sound like if Alex North supplied the music score, then this Nicolosi Amazon Queen may very well be the closest approximation of such. Too early to tell yet without hearing all the tracks, but portions of track 1 sound like a blend between "The Sound And The Fury" and a historical epic.